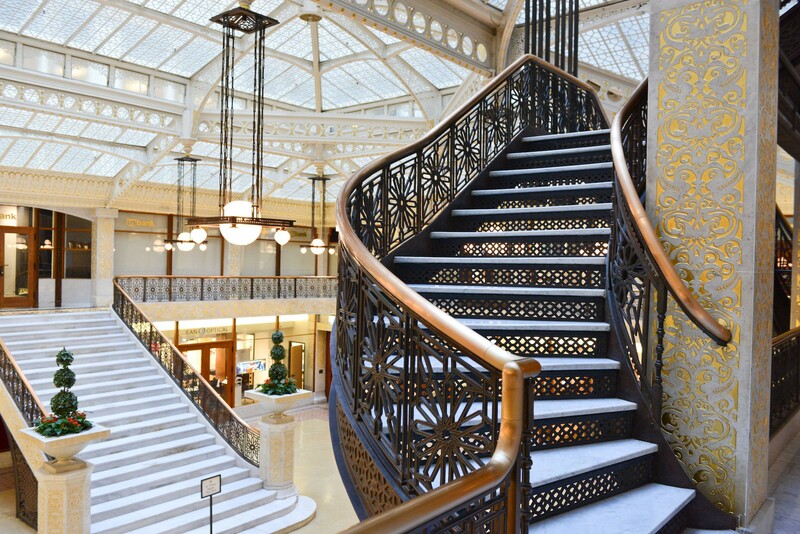 When completed, the Rookery was thought to be the largest and finest office building in the United States. 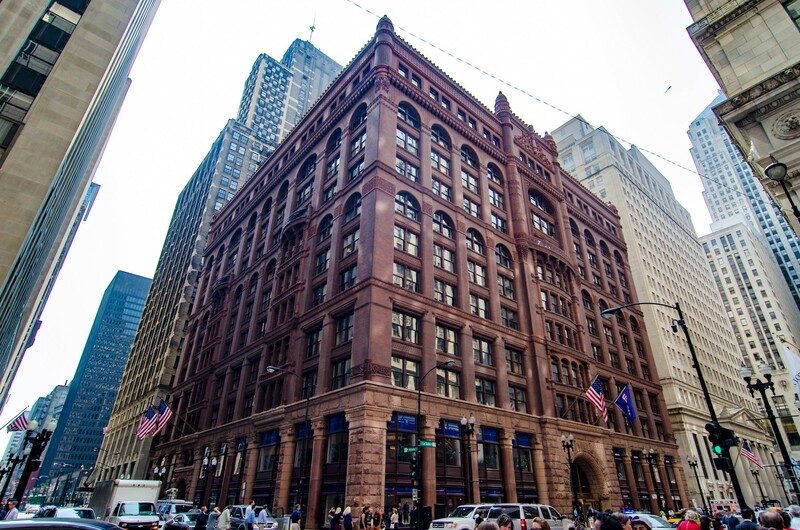 Located at the corner of LaSalle and Adams, the Rookery is one of Chicago’s most elegant buildings and a star of the LaSalle Street financial corridor. 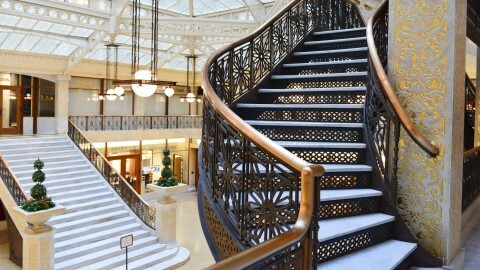 The Rookery was renovated a second time in 1931 by Wright’s former assistant, William Drummond. 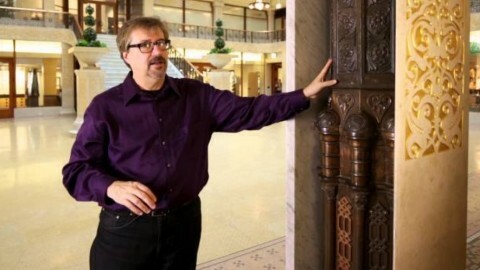 Drummond modernized many of the interior elements and added Art Deco detailing which survives in the elevator lobby. 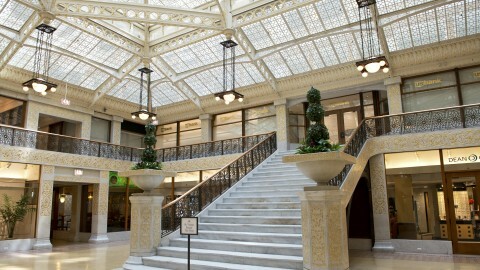 The Rookery’s interior renovation of 1907 is Frank Lloyd Wright's only surviving downtown project. 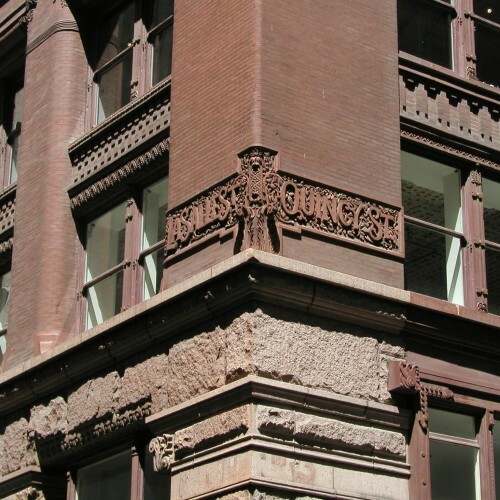 The Rookery traces its name back to the fondness that pigeons and crows (ravens and rooks) had for a municipal structure that existed on the property years before the Rookery was built. 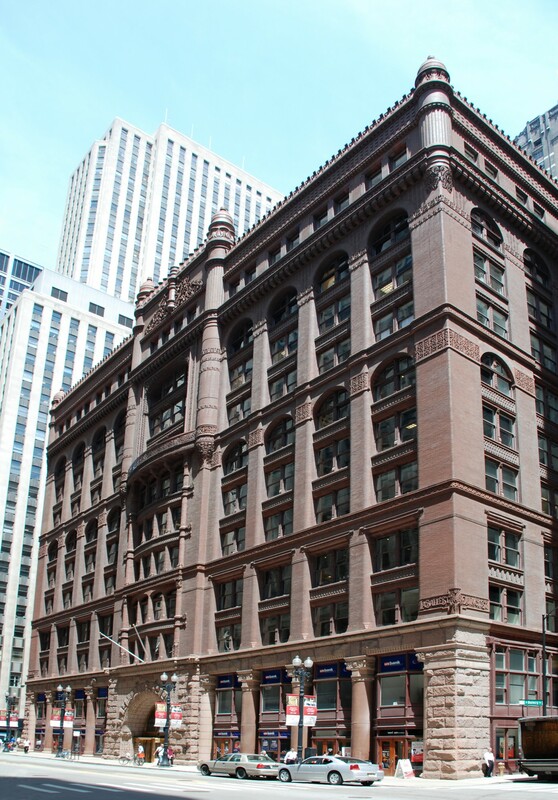 Architects Daniel Burnham and John Root moved their offices into the 12th floor of the Rookery upon its completion. 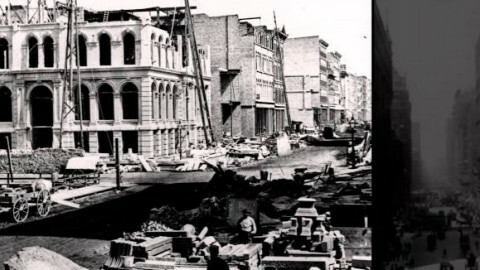 The city’s first public library—a water tower that survived the Great Fire of 1871—previously stood on the site of the Rookery. 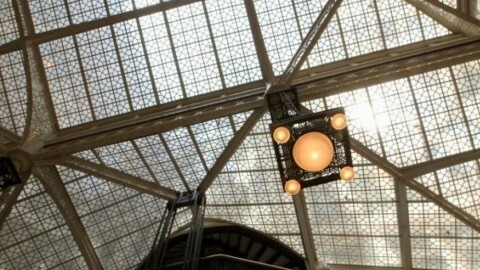 Part of what makes the Rookery a gem is its interior light court. 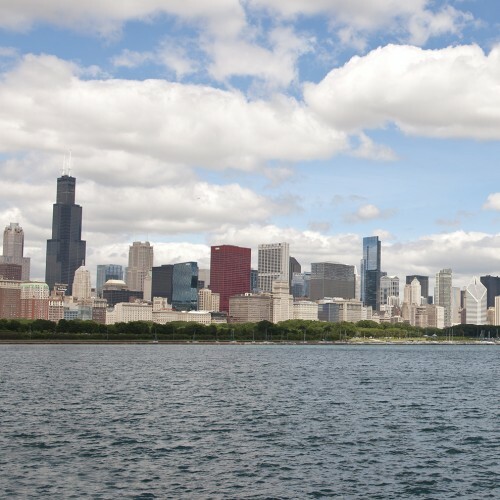 It maximizes the amount of light and air in the building—a critical problem wrestled with by 19th-century architects John Wellborn Root and Daniel Burnham. 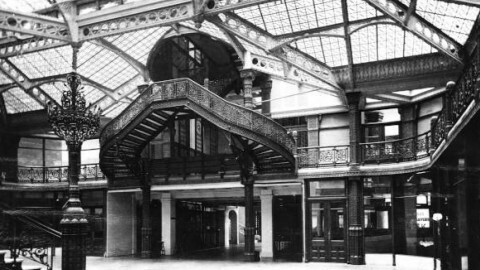 The light court illuminates the building’s square interior plan. 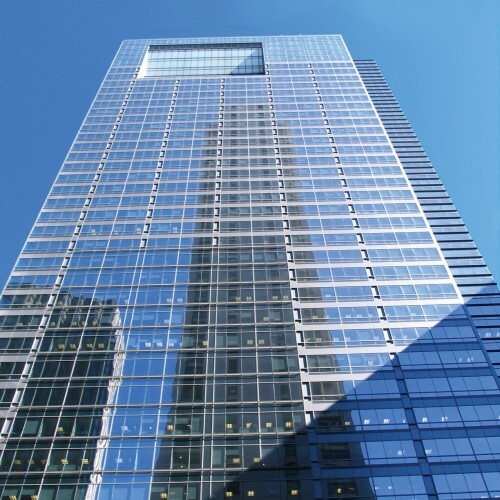 Sheltered by a glass ceiling, the two-story lobby and public space is a sight to be seen. 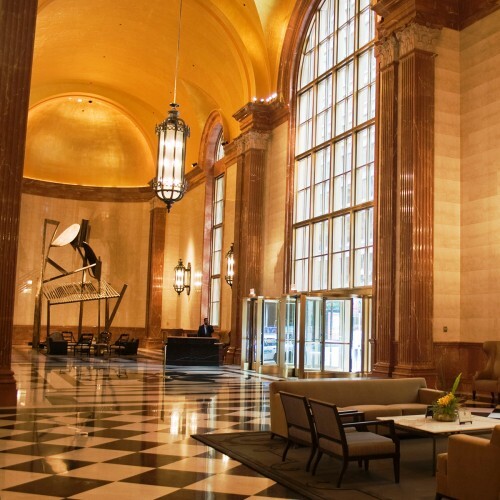 Piers surround the space with moldings clad in white marble with gold geometric patterning. 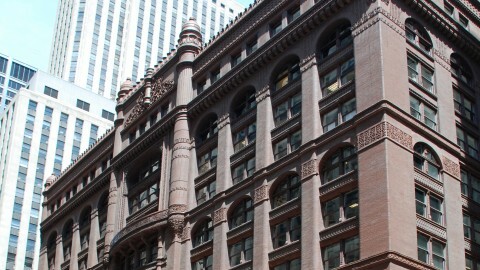 The white marble, part of the redesign by Frank Lloyd Wright completed in 1907, hides the original copper-plated ironwork that John Root created in 1886. 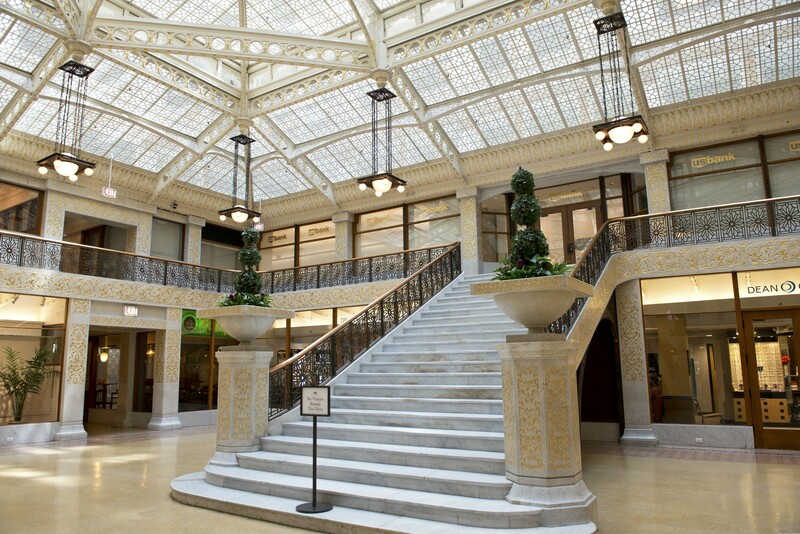 Wright’s updates also included new staircase railings, a steel white paint job for the atrium, decorative urns at the base of the public staircase and new light fixtures. 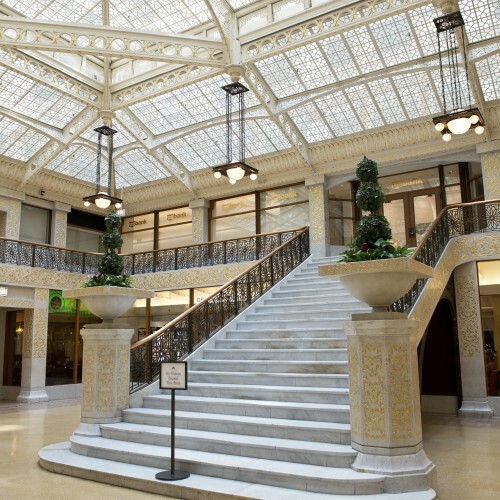 Above the glass ceiling rises a central atrium ringed by offices. 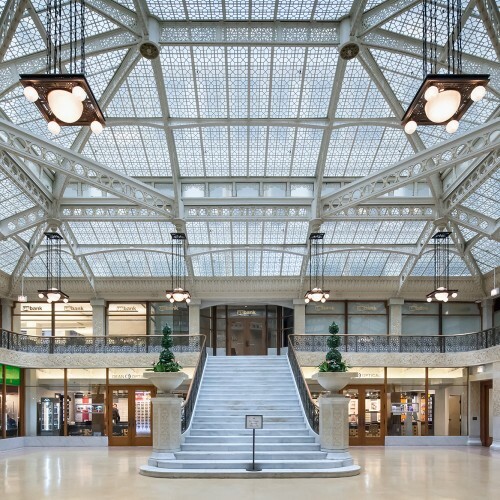 The atrium’s white-glazed brick walls reflect light into the inner offices. Meanwhile, the open center helps circulate air by pulling cool air into the building when warm air rises and is vented out the top. 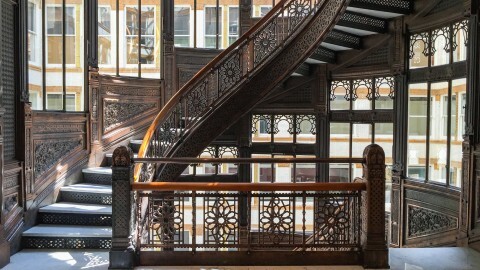 An oriel staircase winds down from the 12th floor to the 2nd floor on the building’s western side, connecting the central atrium with the light court at the mezzanine level. 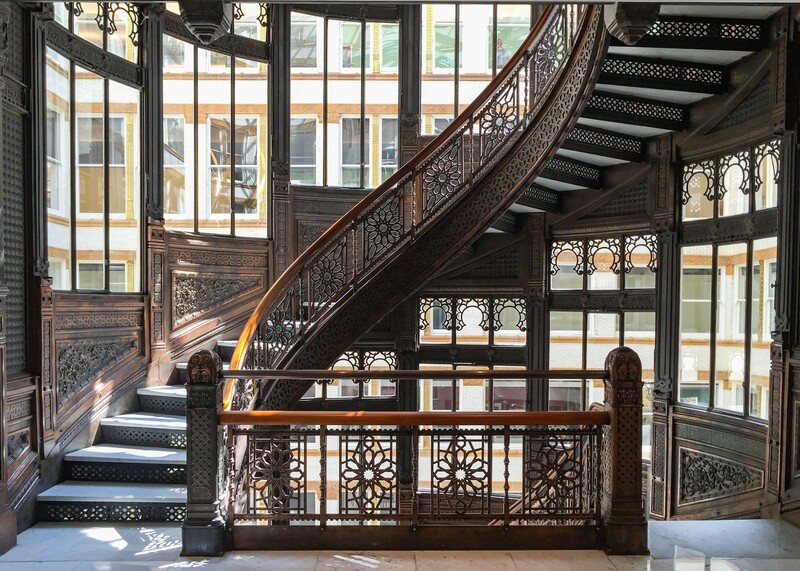 From its colorful exterior to its glistening interior, the Rookery provides an opportunity to experience raw beauty and uncover a myriad of architectural styles in Chicago. 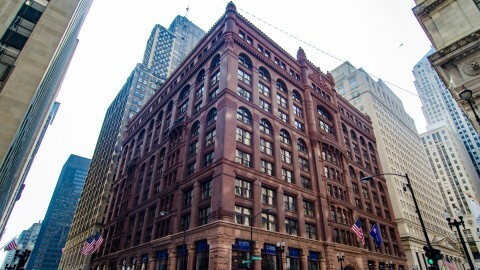 The building, which has been a Chicago icon since its opening in 1888, is a masterful work of engineering. 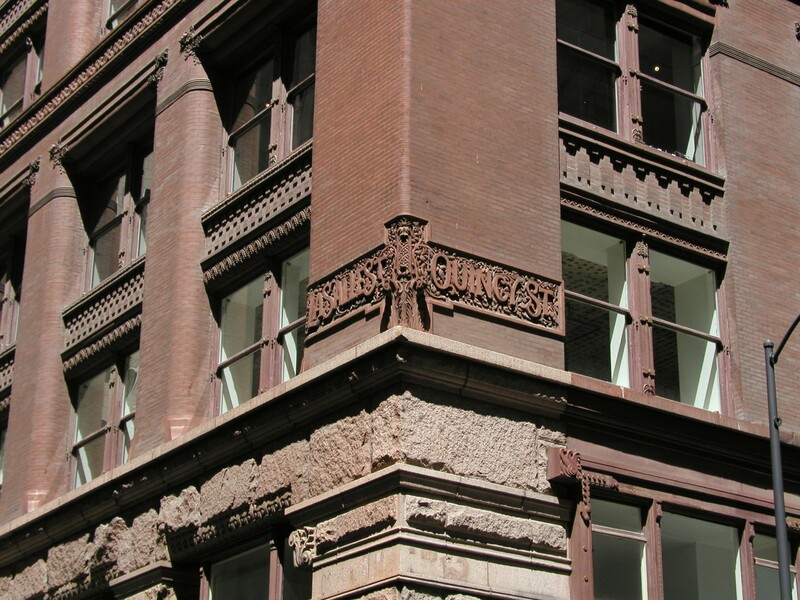 The exterior is an experiment in using historical decorative elements to inform a contemporary office building in the late 19th century. 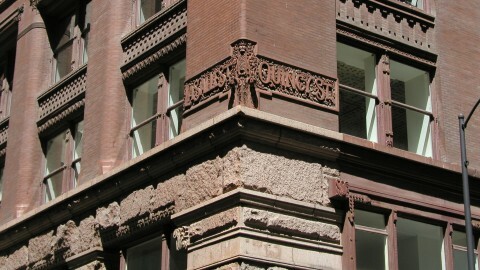 The facade contains decorative elements reminiscent of late Roman, Venetian, Moorish and medieval-European architecture. 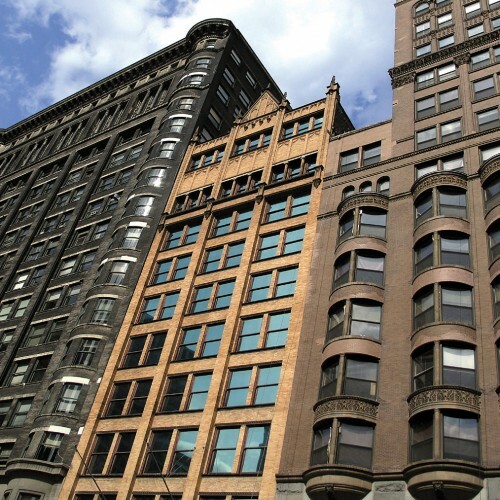 Horizontal bands across the Adams and LaSalle facades draw the eye side to side to minimize the perceived height of the building. These two load-bearing walls are supported by a “floating raft foundation,” a crisscross pattern of iron rails embedded in a concrete foundation that support the immense width of the building.